This image from a Seralini et al. 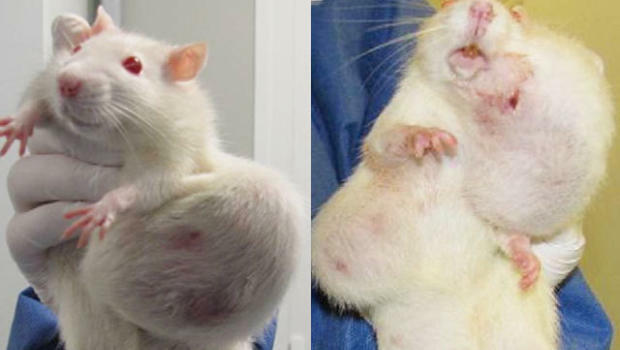 2012 study in the journal Food and Chemical Toxicology shows female rats with mammary tumors that purportedly grew after being fed genetically modified food with and without Roundup herbicide. The study's publisher, Elsevier, announced a retraction of the research Nov. 28, 2013, saying the research cannot draw meaningful conclusions between GM corn and health risks in rats. A controversial study about genetically modified corn that was retracted last year after scientists raised doubts about its findings has just been republished in another journal, reigniting the debate over food safety and scientific responsibility. The study, first published in the September 2012 issue of Food and Chemical Toxicology, and then retracted in 2013, claimed to link genetically modified corn and Monsanto's Roundup herbicide with tumor growth and death risk in rats. The study made headlines around the world with its shocking photos of rats who purportedly were more likely to develop large tumors and die early after eating Monsanto's genetically modified maize, whether or not it was treated with Roundup weed killer. But in November 2013, the journal's publisher, Elsevier, announced that after a "thorough and time-consuming analysis," the study was being retracted due to concerns about the research methodology. Elsevier emphasized there was no evidence of fraud or intentional misrepresentation; it said the study's findings were simply "inconclusive." The researchers, led by biologist Dr. Gilles-Eric Seralini of Caen University in France, protested and even threatened to sue, suggesting that "economic interests" were behind the decision and hinting at impropriety since a former Monsanto employee had recently joined the journal's staff. Now they have gotten the study republished in a lesser-known journal, Environmental Sciences Europe. So what does that say about the validity of the research, and the safety of the products tested? "This whole episode has taken us farther away from knowing the truth," Ivan Oransky, a founder and editor of retractionwatch.com, told CBS News. "The ratio of politics to science when it comes to discussions of GMOs [genetically modified organisms] is so high that I think it often ceases to be useful," said Oransky, a journalist with a medical degree who is also vice president and global editorial director of Med Page Today. In a statement accompanying the republication, Seralini argued that his work had been subjected to "a wave of ad hominem and potentially libelous comments ... by authors having serious yet undisclosed conflicts of interests." Plant specialist Dustin Mc Mahon hand pollinates genetically modified corn plants inside greenhouses housed on the roof of Monsanto agribusiness headquarters in St. Louis, Mo., May 21, 2009. Genetically modified foods remain controversial even as they gain an ever larger share of the agricultural industry. The U.S. Department of Agriculture reports that herbicide-tolerant genetically engineered corn made up 85 percent of acreage in 2013. The study in question fed rats Roundup Ready corn, a genetically modified strain developed by Monsanto to be resistant to Roundup herbicide, allowing farmers to spray their crops to kill weeds without hurting the corn. Critics of the study point out that only a small number of rats were tested and that the type of rats used were predisposed to tumor growth. Other studies have linked residue from the main ingredient in Roundup, glyphosate, to health problems in humans, but Monsanto maintains it has been proven safe. "We are very confident in the long track record that glyphosate has," Jerry Steiner, then Monsanto's executive vice president of sustainability, told Reuters in an interview last year. "It has been very, very extensively studied." Oransky notes that retracted papers do get republished on occasion, and that of the 1.4 million scientific papers published every year, most are inconclusive: "It is the nature of science." Even research of the highest quality needs to be confirmed or extended. The problem, as he sees it, is that all players should be open about their conflicts of interest and receptive to the reasonable concerns of others. Instead, he says this controversy continues with "everyone doing exactly what you'd expect them to do." "This is a good example of what happens when people with hardened beliefs manipulate a system for the result they want," Oransky told CBS News. "Science should be about following the evidence, appropriately changing your mind if the evidence warrants it. But in this case people seem to reject the evidence that doesn't suit their needs."